this is the latest in a series of interviews i'm doing with stylish and inspiring women across different industries. i've always looked forward to reading Ammu's thoughtful comments on everything from sustainable style to local designers on LAM. not only do i admire her work as an Emmy-nominated journalist, but i also love her cosmopolitan, chic style. read on for more! Hello there! Please introduce yourself to LAM readers. What do you do professionally? Hi, my name is Ammu. I am a foreign correspondent based in New Delhi, India. You can see a selection of my work here. Where are you from, and what brought you to Delhi? I was born in Bombay (as it was known then) and lived in Delhi, Singapore, Massachusetts, Oxford, and London before I decided to move to Delhi so I could get some field reporting experience under my belt. I have been living in Delhi since mid-2010. How would you currently characterize your personal style? Has it changed or evolved from a few years ago? I like repetition, as far as my personal style is concerned. So I often get the same garment in a few different colours or fabrics. It makes it easier to get dressed and while I enjoy reading and writing about fashion, I don't like fussing over what I wear. A few years ago - before I moved to Delhi from London - I gave away a lot of what I owned. I prefer a small closet. That wasn't always the case and when I was younger, I owned a lot of stuff. It usually involved taking a lot longer to get dressed and wearing fussier outfits, with too many colours, textures, accessories, all piled on. These days I tend to stick to a cleaner palette - navy, grey, fuchsia, olive, coral and black. And I am much more interested in proportion and cut than in surface embellishment. I am also going through a major delicate jewellery moment...perhaps in reaction to the surge of people wearing statement jewelry. That said, I am holding on to my statement pieces for the day I feel inclined otherwise! Does fashion and/or style play a role in your life? Has living in Delhi shaped your views on this? I have always been interested in fashion. I spent my childhood in India and it was hard not to be drawn to the beautiful fabrics made here. And while India was a little off the map as far as international fashion was concerned, the country had its own fashionable female icons – whether women in politics or royalty or Bollywood stars. And the sari, which seemed completely glamorous to me when I was a child – whether in wispy chiffon or rich, hand-woven silk – still seduces me, with its ability to endure, irrespective of centuries passing. India is seeing an explosion of designer labels at the moment, both home-grown and international. Some of the Indian designers make stunning saris as well. But in the midst of all this, I hope Indian women don't become slaves to brands. I hope they don't lose that self-confidence and knowledge of tradition that enabled them to see, by looking at and touching the fabric, what made one sari more beautiful or better quality than another. Where do you look to now for your style information and inspirations? I go through American Vogue and Vogue India every month. I also read a number of blogs, including but not limited to Un Petit Bijou, Out of the Bag, Les Anti-Modernes, LA in Bloom, Keep It Chic. I like the WSJ and the NYT fashion pages as well. Then there are my fashion books, which I collect and go through from time to time. Recently, there have been a cluster of articles in Business of Fashion and Jezebel about the challenges in maintaining freedom of the press in the fashion industry. What is your take on the phenomenon of blogs and social media? What kind of impact do you think they're having on the media landscape? That BoF piece is right on the money in many respects. I suspect some brands are so big now and have such a substantial, uncritical audience of luxury shoppers, that the opinion of a few well-respected fashion critics means very little to them, and makes no difference to their bottom-line. The former editor of Marie Claire India, Shefalee Vasudev has written a lot about the challenge of dealing with fashion PRs in her book, The Powder Room (I highly recommend it for anyone interested in India and the luxury/fashion business). She calls it "brochure journalism", PR masquerading as journalism. I don't think fashion blogs have necessarily shifted this way of writing, since plenty of bloggers tend to be awed (and occasionally paid) by big brands and their coverage strikes a very slavish note, to my ears anyway. The one thing I will say is that the internet has made a whole range of voices accessible to the general reader, so while the blogs I enjoy may not be the biggest or the most popular, they are not inauthentic or uncritical. But the larger problem hasn't gone away, and is unlikely to go away unless it makes a difference to luxury companies' bottom-line. With all the e-commerce sites and global chain stores, we have so many shopping options now. In your comments on LAM, you've often mentioned local artisans and designers. Are there any designers or shops that you especially love? What about their work draws you in? Oh so many! There are some great boutiques in India, a few that come to mind are Bombay Electric and Bungalow Eight in Mumbai and Moon River in Delhi. But my favourite way to shop is to visit a designer's studio and purchase custom-made, beautifully-cut garments. I have picked up a few pairs of elegant cotton-blend trousers with contrasting silk cuffs from Mayank Mansingh Kaul, which I wear all the time. A favourite recent find has been the label, White Champa. I am currently getting a dress made there, using a gorgeous custom-made ikat silk fabric sourced by the designer. I like these labels because they focus on cut and proportion rather than on surface embellishment. For wool scarves, I go to a local Kashmiri merchant who has an astonishing range of colours and prints. I recently picked up a navy digital print scarf that I wear most days. And for delicate jewelry, I like Ganesha Mania, made by a French designer based in India. As far as e-commerce is concerned, I have been shopping at Net-a-Porter for years, with the occasional foray into Shopbop, the Outnet, and Farfetch. 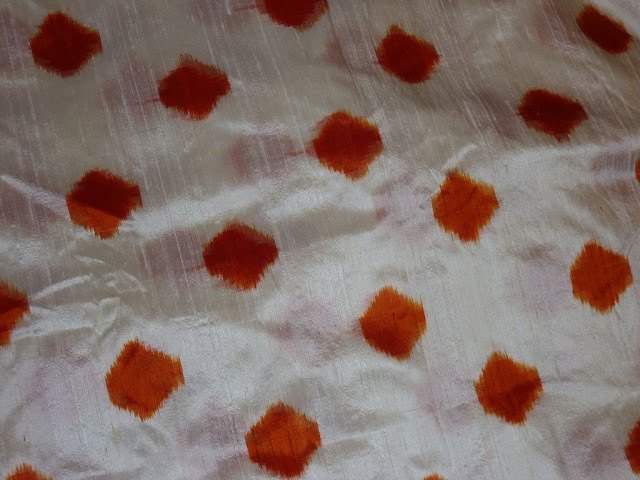 A close up of the silk ikat fabric used for the dress I am having made at White Champa. What's the weather like in Delhi right now? What are some of your favorites that are in heavy rotation this season? The weather in Delhi is pretty perfect at the moment! Sunny days and somewhat chilly evenings. In addition to the pieces I mentioned earlier, I am getting a lot of wear out of my grey Isabel Marant jacket with jacquard cuffs. I am also enjoying a navy Derek Lam blazer and a black wool Carven skirt I picked up last year. Other pieces which I wear often – right through the year, really – include a coral cotton dress from White Champa, my favourite Marc by Marc Jacobs black platforms, a black quilted lambskin Michael Michael Kors bag or a taupe textured leather purse from a local shop called Da Milano during weekends, and a well-worn grey Vince cotton draped tee. 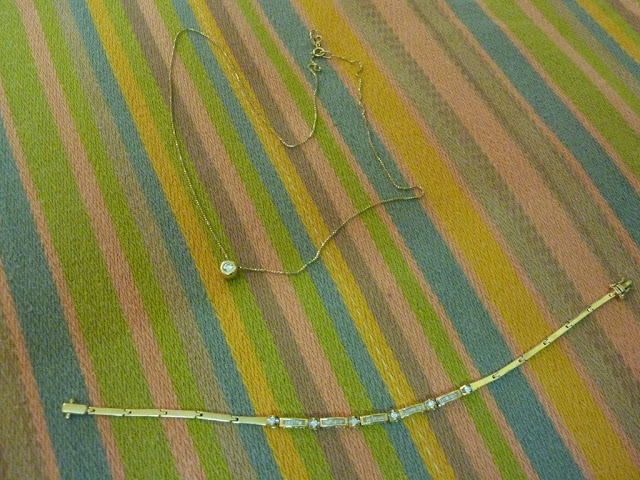 And a couple of delicate diamond and yellow gold pieces from my mom. Here's one of my favorites to ask! What bag are you carrying these days, and what's in it? 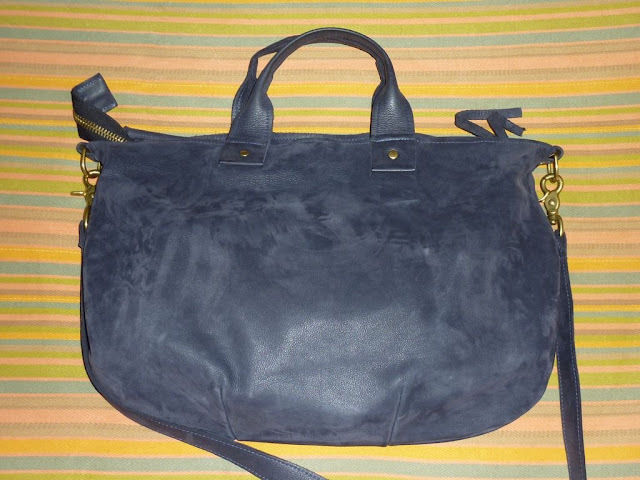 I bought a navy nubuck messenger bag from Clare Vivier over the summer after battling a bad back. It's unlined and weighs very little. And I find myself reaching for it all the time. 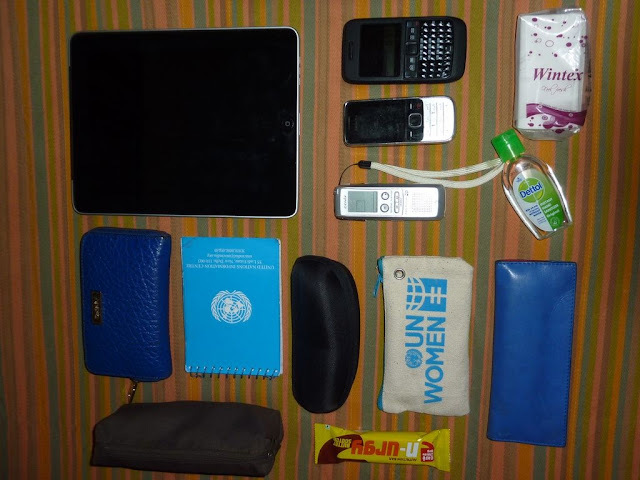 I usually carry my iPad, two phones (one for work, and the other for personal stuff), a small canvas Muji case with vitamins and make-up, a blue leather wallet from DKNY, a blue leather pen case from Belen Echandia, a canvas case (freebie from a UN conference) with my visiting cards, a notepad, hand sanitizer, a recorder, tissues, an energy bar, and my Tom Ford sunglasses (I replaced the original, terribly-made glasses case). The bag comes with an attached pouch, which I use to store my keys and headphones. On a similar note, what are your travel essentials for a work trip? For vacation? Work trips usually involve going to fairly dusty, often grimy places and working very long hours in the sun. So I always pack my jeans, modest cotton tunics, cotton scarves to cover my neck (and head, occasionally). I wear very little jewelry, and carry a Samsonite backpack or a chestnut leather bag from Belen Echandia, which copes well with all the dust. And of course, sneakers and multiple pairs of socks. Vacation packing depends on where I am going. If it's a coastal holiday, then it's usually involves packing embroidered cotton tunics, denim shorts, a chambray mini, gold jewelry, swimsuits, and a selection of flat sandals picked up in Mumbai, Athens, and London. If it's a city holiday, then I pretty much pack whatever I am wearing at the moment. Finally, fill in the blank: I am inspired by _______________________. My close friends and family, who are lovely, generous people. Also, by good writing, great photography, attention to detail, and experiencing new places and meeting people who persevere in the face of huge challenges. You can follow Ammu on twitter @akannampilly, and at her professional website here. Ammu is a very beautiful lady. I like her responses to how she describes her style and the word "repetition" crops up. It means she's found her style and knows what suits. 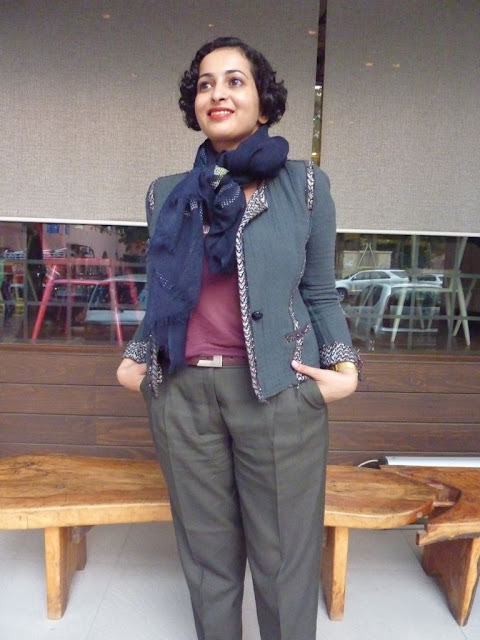 She mixes her colours beautifully - everything compliments from the Marant jacket, the rosy top, the olivey trousers and the modern digital print scarf from her local shawl seller. I like the idea of finding more unique pieces which make a look a little more stand out. Her hair is so 30's inspired - a lovely and inspired look. You are right on the money about my haircut - I *was* going for a 1920s-1930s look and have styled it this way for years. She is fabulous, and I love what she says about the long history of Indian fashion. Dying to visit her tailor and I too hope that Indian women maintain their sartorial traditions. i know! i've never been to Delhi but i'm definitely visiting all of her favorite picks if i go! Caille, thank you for your kind words - India's visual history is so inspiring. And both of you, definitely let me know when you want to visit Delhi! Even I am not based here by then, I will gladly put you in touch with my tailor, favourite designers, etc. Oh, I always love reading comments from Ammu on my blog - she has such meaningful insights and opinions. Thank you for this interview, I've been admittedly curious about her for some time now and this is a great way introduction. Thank you so much, Amanda - am very grateful for the space your blog provides to reflect on consumption. I hope you are doing well! So happy that someone profiled one of the most thoughtful commenters out there, and thoroughly enjoyed this interview. And Ammu, glad I finally got a glimpse of those trousers! Interesting interview! Ammu is always elegantly dressed! Her clothes reflect her personality very well.Her colour sense is fantastic and she looks lovely in everything she wears! I am so late to this.. Thank you for featuring Ammu, Miss Sophie. I see her thoughtful comments on most of the blog I read and it is wonderful to finally see a face to a name. And what a lovely lady! "These days I tend to stick to a cleaner palette - navy, grey, fuchsia, olive, coral and black. And I am much more interested in proportion and cut than in surface embellishment." I stick to white, black, beige and navy these days, with an occasional print as and when I fancy. I really love Ammu's outfit with the carven skirt and vince blouse! Thank you Eileen, I adore the simplicity of your outfits and colour pallette too! Awesome interview with Ammu! She's so awesome :) Great job with the interview. You asked all the right questions! Hey Ammu if you're reading this, I still find the fact that you're my alum is mindblowing. How freaking small is the world?! Thank you Joy! It is a small world and I am always delighted to run into alums/current students from our alma mater. I hope you are enjoying college! Such a lovely, charming interview- thank you both! It's wonderful to see two of my favorites in the blog world collaborate. I always love reading Ammu's thoughtful, insightful and beautifully written comments on my blog. Ammu is such an inspiration- inside and out. I feel very fortunate to have found such a friend. I love Ammu’s thoughts on proportion, cut and repetition. I feel like that’s what I love most right now and what I’m drawn to about design at the moment. Everything is so carefully selected and works just so. 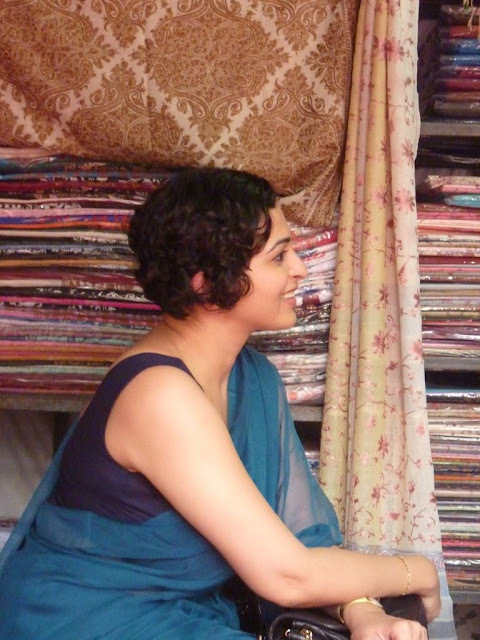 This post has made me so excited for a trip to India – the tailors, fabrics and textiles! Ammu, You look stunning. PS- I think I have hair envy right now! Come visit soon, it would be so much fun to show you around Delhi. I think getting this haircut a few years back was a lightbulb moment, it's much more 'me' than the long curly locks I used to have. Thank you for your lovely words. Ammu is so beautiful! So good to finally "meet" her, she is an inspiration. I love hearing her insights on fashion and especially her takes on everything in India and the quality of garments available there. I'm scheduled to be in New Delhi sometime next year - I will be checking this again for recommendations! Aww, thank you! I think you are gorgeous and I love the positive vibe radiated throughout your blog. Please get in touch when you are planning your visit, would love to show you around Delhi! This is absolutely fantastic! I was thrilled to read this interview - with Ammu, no less. I love your Vince top and Carven skirt outfit. Elegant & practical. 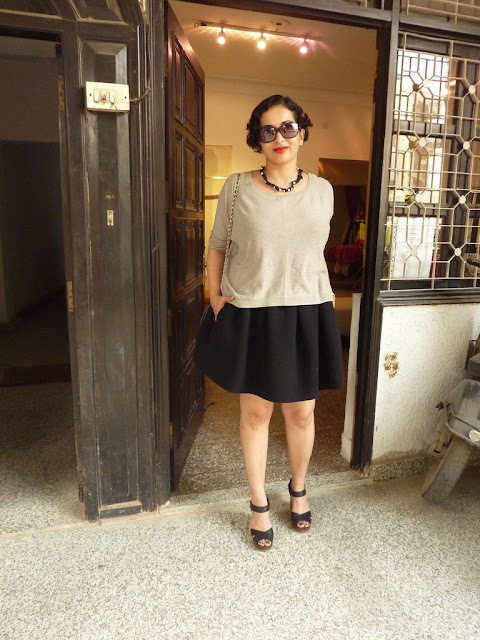 It was refreshing to read your insight about blogging and the current fashion industry. It's a fragile balance which tips either side at any point in time. I remember Tina Craig of Bagsnob mentioned how she'd received threatening emails and letters when she did not write a positive review about a particular brand. That's terrible about Tina Craig - I haven't had those problems mostly because while I do occasionally write about fashion, I never do reviews. In India, I have seen it go both ways, brands handing out swag to journalists as well as journalists demanding free stuff or heavy discounts in exchange for positive coverage. It's sad.